The finding of HMS Investigator has made headline news across the world. What a great achievement! Here, as well as a description of the campaign, the team and their plans, there are some wonderful pictures not just of the ships but of the graves and the remains of the cache of stores which McClure left on shore. From the perspective of the search for Franklin this relocation of HMS Investigator is almost eerily significant. The Investigator, with her companion HMS Enterprise, was the first ship to set out to try to find the Franklin Expedition in 1848 at a time when most members of that Expedition were still alive. So it was the Investigator which opened the largest and longest search and rescue effort in history – the quest to find out what happened to Franklin, his men and his ships. It is very fitting that this Parks Canada team, with the powerful modern Canadian ice-breaker Sir Wilfred Laurier, should have made this direct link with the first ship to take part in this search. The dramatic pictures of the Investigator will serve as a welcome reminder of the remarkable achievement of her Captain, Robert McClure and his men, in being probably the first people to complete the North West Passage. (Let’s not forget that it is perfectly feasible that some Inuit peoples made this same journey earlier, but sadly memories of that epic of exploration will have been lost). And anyone who looks at the Parks Canada map must feel a chill of horror at just how remote the site of the Investigator is. How brave these men were to push themselves into such a hostile and remote part of the world. And while McClure may not have had a very good press for some of the harsh decisions he took, and contemplated, unlike Franklin he was able to bring most of his men home. It’s wrong for us today to be judgemental in the case of a man placed in such a hugely difficult position with such terrible responsibilities. Another significant aspect of this dramatic news is the light it may help shed on the Franklin Expedition itself. The Investigator was fitted out only three years after the Erebus and Terror. It is fitted with the same Sylvester central heating system with which it now appears the Erebus and Terror were equipped – the longstanding allegation that that those ships had a steam heating system now seemingly a misconception. A scientific examination of her must surely help us better understand what may have happened to the Erebus and Terror. Also very important is consideration of the graves of the three crewmembers of the Investigator who died at Mercy Bay. Should they be left there? The decision should be for their next of kin, who are perhaps not yet aware that their distant relatives bodies’ still lie frozen in Mercy Bay. A further decision these unknowing relatives may consider is whether to have their relatives’ bodies’ autopsied. Such an examination is intrusive, but would no doubt shed very valuable information on the disease and dietary conditions on Arctic ships of the time. 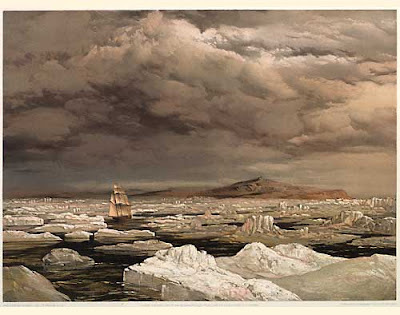 Re-reading Sherard Osborne’s ‘The Discovery of the North West Passage..’ I see that the death of AB John Boyle, first man to die, was said to have been ‘occasioned by the thoughtlessness of the poor fellow himself, who, by way of a joke, went into the surgery and drank off the washings of several medicine bottles’. One wonders whether this was the whole truth. Especially since the two other men to die at Mercy Bay, AB John Eames and John Kerr, Gunner’s Mate, did so only a few days after AB Boyle. Already there have been calls for the Investigator herself to be raised and taken back south to form the core of a museum in southern Canada. And why not? While the ship has been remarkably preserved in Mercy Bay where she lies, even there she must be vulnerable now to treasure hunters and also to further damage by large icebergs. The relocation of the Investigator is bringing to the fore decisions which will have to be faced if the Erebus or the Terror are ever discovered. In many ways, these ships are now part of the North and should remain there. But the ships may still contain the mortal remains of some of the officers and men of the Franklin Expedition, and their relatives may well feel repatriation is appropriate. Once located, the ships will be vulnerable to further degradation by Nature and by man. So this great news should help us applaud the memory of McClure and his men, wonder at the preservation of their ship HMS Investigator and wish the very best of good fortune to those who are searching for Franklin, his ships and his men this summer. Will there ever be an end to this story? Re your last sentence: probably not. As to whether the bodies should be repatriated for burial in "home soil" or autopsied to help unravel the mystery of why they and the Franklin crews ALL perished - I see a potential can of worms. To start with, the obvious problems of identification arise. If I could be certain that the remains of Josephus Geater had been positively identified by means, say, of DNA testing, then I would feel happy to have him interred in Aberdeen. Otherwise, I would prefer that the Arctic remain his resting-place. Given that bodies representing about 25% of the men who sailed on the Franklin Expedition have been subject to some form of scientific investigation, it is revealing to think that there is about a 1 in 4 chance that some remains of your ancestor Josephus Geater have already been analysed somewhere. The difference with the Investigator burials though, is that we know who the three buried there are, although as far as I am aware we don't which body is in which grave. Therefore if the next of kin of all three could be identified, with a probability of a DNA match for any two of them, it would be possible to do this with the relatives' consent.